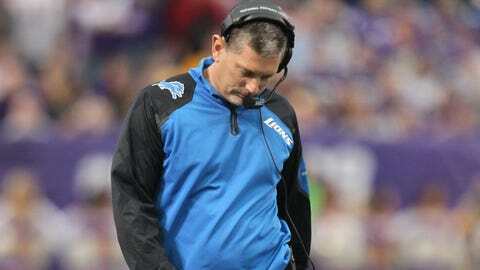 ALLEN PARK, Mich. – Jim Schwartz inherited a pathetic football team five years ago and made it respectable. He took the Detroit Lions to where they’re expected to make the playoffs and win division titles. Despite his flaws, he’s leaving behind a much better product than when he arrived, which should make the job as his replacement very attractive to the top candidates. The onus now is on the Detroit Lions’ front office – primarily president Tom Lewand and general manager Martin Mayhew – to identify the right man to push this club over the top. "The bottom-line message is, from our ownership on down, we are unwaveringly committed to bringing in a consistently winning football team to this town immediately," Lewand said Monday. If that isn’t accomplished, he and Mayhew could be the next ones on the way out. Despite being owed nearly $12 million for the next two years, Schwartz did not survive the NFL’s Black Monday. He finished with a 29-52 record in five years, including one playoff loss two seasons ago. 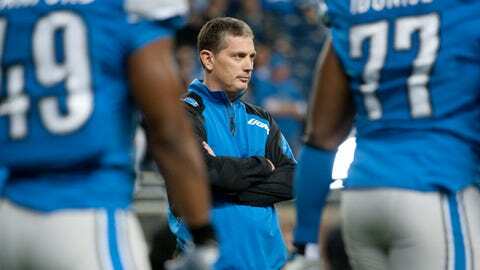 The last straw was Schwartz’s failure to make the playoffs this year after the Lions jumped out to a 6-3 start to take control of the NFC North. They were unable to take advantage of injuries to Green Bay quarterback Aaron Rodgers and Chicago quarterback Jay Cutler, losing six of their final seven games to finish 7-9. "That’s not acceptable," Lewand said. "We think it’s time for somebody to take over to put us over the hump and take us to the next step," Mayhew added. Schwartz took over a 0-16 team and improved that record each of his first three years – to 2-14 in 2009, 6-10 in 2010 and 10-6 in 2011. The problem is the Lions then made a huge step back last year to 4-12 and failed to win a division title this year for the 20th straight season because of the poor finish. In seven of their losses, they squandered fourth-quarter leads. Over the last two years, they have a combined record of 2-14 in the second half of the season. "We did not win the division title, we did not win enough games," Lewand said. "We made the changes today that we think are necessary to get us to those goals." Schwartz stood up and announced to the players that he had been fired during an emotional team meeting around noon, shortly after he had gotten the final word. "He put himself and this team in a position where we were expected to win a lot of games," receiver Nate Burleson said. "Because we didn’t, he got fired. It’s a raw business." Knowing the nature of the NFL, offensive guard Rob Sims expected the change. "I’m not surprised," Sims said. "I knew it was coming. I’m not happy about it because we still are close (to being a playoff team/division champ). I didn’t think this was the answer but I just play left guard." Linebacker Stephen Tulloch believes the club now needs to look for an experienced NFL coach. "The window of having good players is very slim," Tulloch said. "You’ve got to take advantage of it now. The longer you wait, that window closes so whoever comes in here needs to take us over that hump. "You want somebody that has been through it all and understands what it takes to take that next step. We’re a bubble team. We’re there. There’s a lot of talent in this locker room. The window’s now. We can’t wait any longer. We’ve got to find a way to get to that next step." Schwartz’s teams came close to having a major breakthrough, but they simply couldn’t finish the job. Six of their losses this year came by a combined total of 16 points, including the last three by just six points. Video: What’s next for the Lions? On some days, they appeared to be very talented and very close to putting it all together and possibly even contending for a Super Bowl. But other days, they came off as a mistake-prone, undisciplined team under Schwartz that blows up when it matters most. The typical reaction at times like this is to hire the opposite of what you fired. Schwartz was a fiery defensive coordinator who came in with no head-coaching experience. He had to learn on the job and he made his share of mistakes along the way. The ideal replacement quite possibly is someone who has been a successful NFL head coach, someone with an offensive background who can help quarterback Matthew Stafford bounce back from his late-season struggles and someone who has an even-keel demeanor to help turn this into a more-disciplined team. The candidates being mentioned most for NFL jobs this off-season include former Arizona Cardinals coach Ken Whisenhunt (currently San Diego’s offensive coordinator), former Chicago coach Lovie Smith, Penn State coach Bill O’Brien (a strong candidate for the Houston Texans’ opening) and former Denver coach Josh McDaniels (currently New England’s offensive coordinator). NFL.com reported the Lions already have requested permission from the Arizona Cardinals to interview defensive coordinator Todd Bowles, who was reportedly a finalist for the Detroit job five years ago. Whisenhunt, who led the Cardinals to the Super Bowl five years ago, has a reputation as a top-notch coach of quarterbacks. He and Mayhew were teammates briefly with the Washington Redskins. That appears to be the most obvious, possibly even the best target for the Lions, who need to move smartly but swiftly because they’re not the only ones looking for a new coach today. — Mayhew, on a report that the front office and coaching staff weren’t talking at the end: "Totally wrong, totally off base." — The Lions will have the No. 10 pick overall in the NFL Draft next May. It will be the 10th time in 13 years that Detroit has a top-10 selection. Home: Chicago, Green Bay, Minnesota, New Orleans, Tampa Bay, New York Giants, Miami and Buffalo. Either Miami or Buffalo – one of the AFC opponents – should be the Thanksgiving Day game. Road: Chicago, Green Bay, Minnesota, Atlanta (in London), Carolina, Arizona, New England and New York Jets.